QUAD CITIES - Did your car actually get dirtier with Thursday's rain? You're not alone. 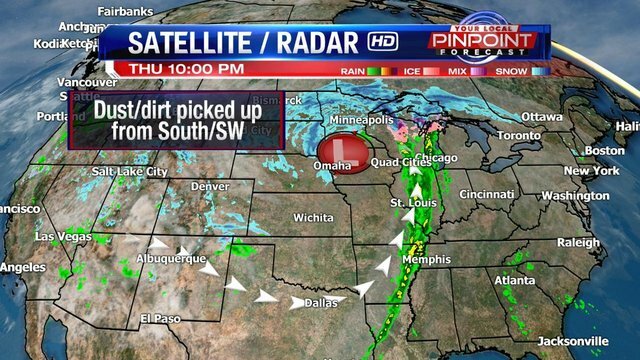 "Dirty" rain fell in the Quad Cities Thursday as a big storm is rolling through the middle part of the country. This same storm went through the West/Southwest over the last few days. While rolling through that part of the country, the strong winds whipped up quite a bit of dust and dirt. There was more than likely some tree pollen mixed in too. Those particulates were lofted into the storm. Then, in the Quad Cities on Thursday, the dust, dirt and pollen along wtih some raindrops "rained" down on the Quad Cities! Parts of Minnesota actually had a light brown layer on top of snow falling there! Same thing as here, that was a deposit of dust/dirt/pollen from this big storm!